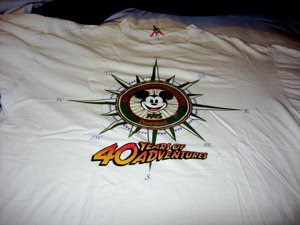 This is a t-shirt from The 1995 Official Disneyana Convention, celebrating Disneyland's 40 Years of Adventure. Notice the "Indiana Jones"-styled lettering on the shirt. That's because the attraction, "Indiana Jones and the Temple of the Forbidden Eye" made its debut in 1995, and it was a great year for Disneyland. That attraction was one of the most spectacular rides to date at a theme park, and today is still one of Disneyland's most popular attractions (I was there a week ago, and the line was really, really long!) 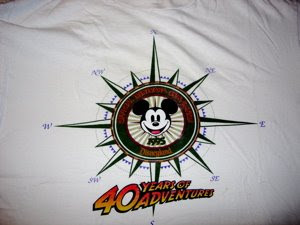 I love this t-shirt- it's held up pretty well over the years. I do wear it, a lot, and somehow it's still lasting. That Official Disneyana Convention was a blast, too- Disneyland sold a lot of really cool, collectible stuff, some of which I did manage to purchase.